Lazing around in crumpled sheets, sun streaking through the blinds, your eyes slowly blink open and your lips curl into a slow smile. You make some deep, grunting noises as you twist your back and stretch your neck. You smile and enjoy the soft and slow process of waking up after sleeping in on a weekend morning. You glance casually at the alarm clock, you stare at the ceiling, flip your pillow, and roll around in Sheetworld. 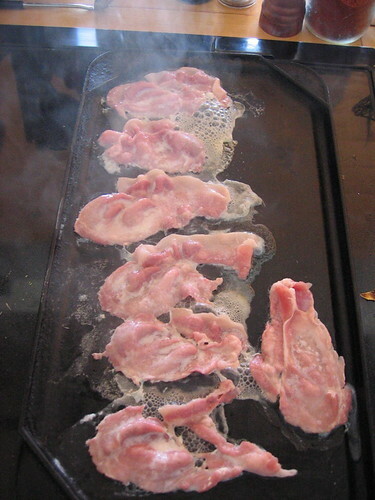 Nose twitching, brain sniffing, you catch faint fumes of sizzling bacon drifting up from the kitchen. Can it be? Is this why you woke up? You bunny-sniff again and this time you’re positive, you’re certain, you’re sure. It smells like mom’s cooking breakfast. It smells like a sunny Sunday sleep-in. It smells like pajamas and a fresh paper. It smells like little white grease bubbles in a crispy black frying pan. Well, not when you’re a vegetarian. That just means *gag. * But I will admit, bacon -was- good. Hell, I’m a vegetarian and I still love the smell of bacon. Are you serious? Did you actually just type that? I don’t get why Jo told Sasha to get over themselves? Because the person is vegetarian? The amount of meat related blogs on this website are unbelievable and I don’t see vegetarians saying “Get over yourself!” about it. i haven’t smelled this in forever since my husband’s a vegetarian. i guess i will never smell it again. not awesome. Waking up to the smell of coffee is a close second. Totally awesome! Especially when mixed with the smell of freshly brewed coffee – smells like waking up and delicious! Bacon at the cabin on a cool morning is possibly even more awesome. Bacon always tastes better in the fresh air! You know how you can get those things where it’s basically a kettle set to go off at a certain time for the morning? Somebody should totally invent the same for bacon. Now the smell of fresh waffles wafting and undulating on a Sunday morning, now that is awesome! The smell of inanimate bacon is. Being Jewish, I mentally substituted challah and cholent while reading this article. This blog is really cool! What a wonderful, smile inducing post! I rarely get to wake up to the smell of bacon, seeing that my husband and I occupy a garage which, sadly, does not include a kitchen. However, if we spend the weekend with my mom, we always wake up to the tantilizing aromas of bacon spattering and coffee brewing. Yum! I stopped by from The Happiness Project. Very glad I did! Not all Jews are observant. I cook it in the microwave. Two strips take about 2 minutes. I put the bacon in a microwave dish, and a paper towel on top and bottom of the bacon. I would love to wake up to the smell of bacon! Alas, it’s always me cooking it, though, so I never get to wake up to the yummy smell like I used to at my Dad’s. Now I use it to wake up my husband and kids! Although, if I had the Wake ‘n’ Bacon, I would most definitely use that sucker at least once a week! First – obviously this is TOTALLY awesome. I think when you’re done with this blog, you should start: “1000awesomethingsaboutbacon.com”, which would actually fairly closely overlap with “iheartbacon.com”. Absolutely! Mine was similar to Tamsyn. I was the one cooking the bacon, and for me it was the beautiful sight of my three small boys to come stumbling in with their sleepy eyes and little noses pointed at the table with a big breakfast on Sundays. My totally wonderful husband makes bacon for me every morning! How awesome is he? Mmmmm bacon – my mouth is watering just *thinking* about the smell! Bacon is so awesome. I love the smell and the taste. Heck, I even think the word bacon is cool. I just made bacon. I wore a shirt. It was awesome. Add this blog to the list of Awesome Things! First time I stayed over at my (then) girlfriend’s place, she made me bacon for breakfast. Man that girl was amazing. Pretty much one of the best ways to wake up ever in the history of mankind. I would have been a vegetarian if not for bacon! This brings back wonderful memories of being at my grandparent’s house as a child and being a bit scared to go to bed, because they lived out in the boondocks and it was scary at night, but then waking up with the sunbeams peaking through the drapes on the window and the sound and smell of the sizzling bacon in the kitchen that grandma was frying up and realizing that I had made it through the night and everything was gonna be OK! love the smell of bacon X) mmmmm… but i hate it when its like >40% fat. urghh, vomit inducing. Weird thing is…I love the smell of bacon. But when I eat it…I can only choke down about 2 pieces. And I’m not a vegetarian. o_O OH well :) enjoy the smell anyways. Especially when campfire coffee and campfire bacon. Trust me on this one- if you’re going to do it, JUST DO IT! Do not let anyone convince you that any alternative like turkey bacon is better for you…because it’s just atrocious really. Pork defo rules here! OMG!! I was waiting for this one forever!!! I wish I could say a speech on how good bacon is, but, I can’t!! All I have the right to say is AWESOME!!!! AHHHH WAKING UP TO THE SMELL OF BACON IS SOOOO AMAZING AND AWESOME! Yes! Just yes! I honestly don’t know anyone who like bacon more than I do. I was so proud the other day, when I made bacon in the microwave, which doesn’t smell as strong as frying it, and my little brother came downstairs when I finished eating and asked “is that bacon I smell? !” My mom couldn’t even smell it and she was in the kitchen when I was making it! Thanks for the good writeup. It in reality was a amusement account it. Glance advanced to far delivered agreeable from you! By the way, how can we be in contact? come faccio dopo ke lo installato?